The 320 series when mounted as a flat under / bottom mount, has the slide height of .70 inch / 18 mm and slide width 1.31 inch / 33 mm. 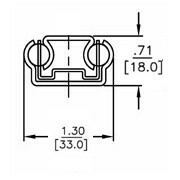 The 320 series is a 2-piece partial extension device. This series of slides is ideal for applications such as cash drawers, printers, platforms, trays, vending shelves, ticket dispensers, utility drawers, keyboards, sorting machines, and many other industrial installations. 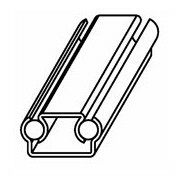 In certain applications this series can be mounted as a “top guide slide” to act as an additional stabilizing method in conjunction with lower load carrying slides.